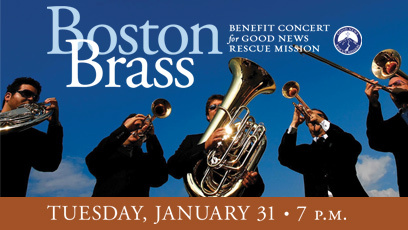 REDDING, Calif. – On Tuesday, Jan. 31, the Simpson University Music Department will hold a music concert with Boston Brass to raise money for the Good News Rescue Mission. The concert will take place in Simpson's Heritage Student Life Center at 7 p.m.
For nearly 25 years, Boston Brass has treated audiences to classical arrangement, jazz standards and the best of its original brass quintet repertoire. As noted on the group's website, "The ensemble's lively repartee, touched with humor and personality, attempts to delight audiences in an evening of great music and boisterous fun. Proceeds from this event will help the Good News Rescue Mission continue to provide valuable services for the underserved in Shasta County and surrounding areas. Proceeds will also benefit Simpson music program for students and the community. Carl Hawkins, community relations assistant of the Good News Rescue Mission, said, "Food donations were down about 40 percent last year, and there were times that we needed to turn people away. We still have some pretty big needs to fill around here, and we appreciate all the support and assistance we receive." Advance tickets can be purchased for $12 online at simpsonu.edu/musicevents. Tickets will also be available at the door for $15 general admission or $12 for seniors and non-Simpson students. For more information about the Good News Rescue Mission, or to make a monetary donation, visit www.gnrm.org. For more information about the Boston Brass concert, visit simpsonu.edu/musicevents or call the Simpson Music Department at 226-4507.